Last week I had the urge to bake. I browsed through my favorite recipes and had that feeling that I have made all of this stuff a hundred times... I promised Roo I would have cookies for him when he came home from school, so I started browsing recipes I hadn't tried before. I stumbled across this recipe for S'mores Cookies and decided to give it a whirl. I am so glad I did! These cookies are addictive. They are sweet, have gooey spots and are sure to please even the toughest cookie critic! So yummy I had to sneak a bite before photographing! Put marshmallows and 1/2 of the chocolate chips on a plate and set aside. Add eggs and vanilla extract and beat well. Stir in half of the chocolate chips. Add dry ingredients mix until combined. Drop two ounce cookies onto ungreased baking sheet and bake in 350 degree oven for seven minutes. Take cookie sheet out of oven and press three marshmallows and three chocolate chips into each cookie. Return to oven and bake for an additional two minutes or until marshmallows are melty. These S'mores Cookies were a big hit with my family! My son said "Mommy? You made these?" Like he couldn't believe I tried a new cookie recipe! It was so cute! These are now going into the group of favorite recipes to bake! I know we will whip up another batch of these very soon! They were incredibly easy to make; the hardest part was pressing the marshmallows and chocolate chips into the cookies during the baking process! What is your favorite kind of cookie to bake? I would love to hear about it! 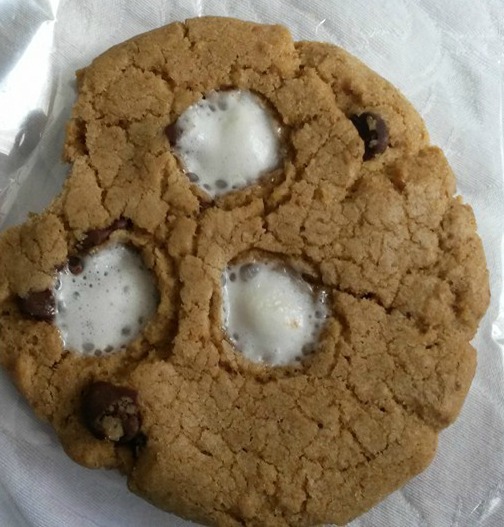 I like the idea of a s'mores cookie! Sounds like a tasty twist :) Thanks for sharing with Merry Monday!